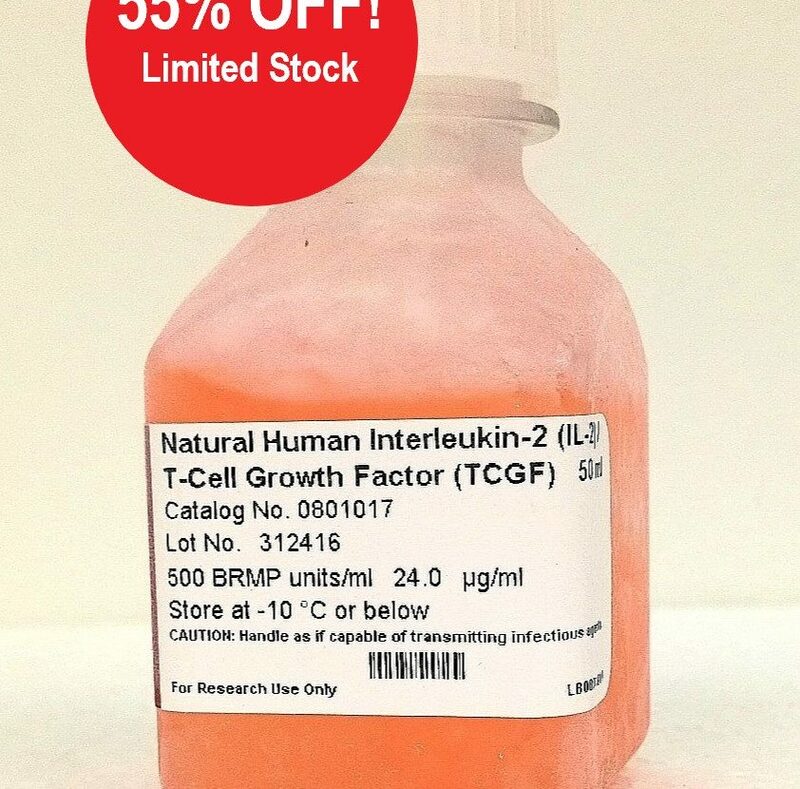 TCGF (Natural T-Cell Growth Factor, IL-2) -55% OFF*! Promotion valid until 31 JULY 2018 or termination of current stock. Cytokines and Growth Factors 50 ml -20° C.
Each lot of IL-2/TCGF is analyzed for its ability to stimulate proliferation of seven to ten day old PHA-transformed human T- lymphocytes. When used at a final concentration of approximately 10% (v/v), IL-2/TCGF will induce a minimum fivefold increase in cell concentration of such cells when seeded at a density of 2.0 x 105 / ml. IL-2/TCGF, a glycoprotein with a molecular weight of approximately 15,000 kDa, is produced from pooled human PHA-stimulated T-lymphocytes. IL-2/TCGF is purified by several chromatographic steps to remove PHA and interferon. This preparation will support growth of most IL-2/TCGF dependent lymphocyte cultures at a final concentration of 10% (v/v). The initial cell densityshould be approximately 2.0 x 105/ ml and the cell culture should be adjusted to this density every four to five days by additional feeding with 10% IL-2/TCGF. The initial cell population may need to be blast-transformed by either mitogenic or antigenic stimulation such as with PHA. Optimal concentration of IL-2/TCGF and/or mitogen must be determined experimentally by the investigator. Each 50 ml bottle contains approximately 25,000 BRMP (Biological Response Modifier Program) units of IL-2/TCGF at a concentration of approximately 500 BRMP units/ml. It is supplied as a sterile solution in 25mM HEPES buffered RPMI 1640 culture medium which is free of serum. IL-2/TCGF protein concentration ranges from 8-22 µg/ml. Contact our customer service for more details or for a request of quotation.